The Central Lancashire 5K began life when BUH&AC joined the Central Lancashire Grand Prix endurance competition in 2011. Taking place in mid-February, it is the CLGP’s opening fixture and competitors are rewarded with a surprise memento on finishing. From 2013, chip-timing has been used. For 2015-16, it also counted towards the Northern Masters Championships (previously Northern Veterans); this may return in future editions. The next event is on Sunday, 17th February 2019 starting at 9.30am prompt. Registration is on the indoor running track at Leverhulme Park (use postcode BL2 6EX for sat-navs) and is open at 8am. The race is held under UKA rules and minimum entry age is 14. Mp3 players are not permitted. The course is suitable for all levels but not wheelchairs. 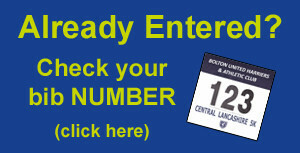 Please allow enough time to park and enter/pick up your race bib ahead of the race start time. BUH&AC makes every effort to ensure that this race is held as scheduled. However, in the event of causes outside our control triggering a race cancellation, please note that our policy is to not encourage the refund of entry fees. As is common with other ‘community-inclusive appropriately-priced’ running events organized by athletic clubs, we would hope to attempt to reschedule the event and offer a carry-over instead. Where this is not possible, we would hope entrants will appreciate that an event of this scale is many months in the planning with considerable attendant cost, much of which is either spent or committed well ahead of the event. Entries cannot be exchanged or refunded after purchase unless the event is canceled. If the event is canceled (for any reason) you may seek a refund of the entry fee. Personal arrangements including travel, accommodation or hospitality relating to the CL5K which have been arranged by you are at your own risk. Liability for the cancellation or rescheduling of an Event will be limited to the refund as set out in these terms and conditions. We will not be responsible for any loss, theft or damage of your personal belongings, other than caused as a result of our negligence or another breach of statutory duty. 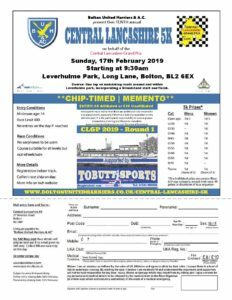 All the entries currently received and processed for the upcoming Central Lancashire 5K can be viewed by clicking THIS link or the image to the right. The race is anticipated to be well attended, so all CLGP runners are advised to enter early to avoid disappointment if the limit is reached on the day. For NMAC members, you MUST pre-register to count for Championship points. The current route was introduced ahead of the 2015 race and is similar to that first used, being entirely within and around Leverhulme Park on road/sealed terrain. It is slightly quicker, especially with the two hairpins and much-loved sting-in-the-tail being lost! Click the Route Map for a larger version. 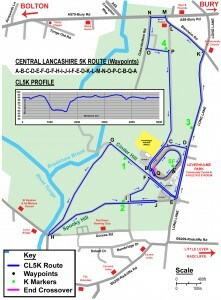 Alternatively, Click HERE to download the current CL5K ROUTE MAP in PDF format. Part 1 (Blue line): After exiting the athletics track anti-clockwise, a clockwise loop of the car park is done to complete a ‘figure of 8’ before the drop down Cinder Hill. The lower parkland track to Woodside Place is completed before a drag up Spooky Hill leads to the main path beside the lower football pitches. A right turn followed by a raise to the embankment overlooking the upper cricket pitches is followed to Long Lane and the car park entrance. Part 2 (Yellow line): A shallow drop down the tree-lined path encircles the children’s play area again, leading to the bus terminus via the Powerleague access road. Runners then complete a ‘rectangle’ of roads – heading north via Long Lane, west via Blenheim Road and returning to the track along the Park’s main path. The track is entered via its exit point. 2020: Coming soon…after the race!!! 2019: Coming soon…after the race!!! 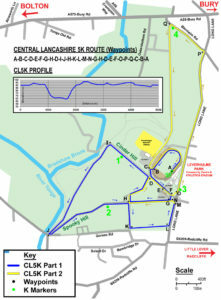 The first route used for the CL5K was entirely within and around Leverhulme Park on road/sealed terrain. After exiting the athletics track, an external clockwise loop of the facilities is done before the drop down Cinder Hill. The lower parkland track to Woodside Place is completed before a drag up Spooky Hill leads to the main path beside the cricket pitches. A hairpin turn just before the car park is performed, followed by a circumnavigation of the children’s zip-wire/play area, eventually leading to the bus terminus via the Powerleague access road. Runners then complete a ‘rectangle’ of roads – heading north via Long Lane, west via Blenheim Road and a skirting of Bury Road and returning to the track along the Park’s main path having entered up Oakenbottom Road and the ‘sting-in-the-tail’ up Lever Hall Road at 4km. To contact the Organisers of the Central Lancashire 5K, please click HERE to email or use (CL5K @ boltonunitedharriers.co.uk in your email client) but bear in mind the week prior to the race is extremely busy and will affect response times. BUH&AC would also like to thank Dougie Tobutt of Tobutt Sports for kindly supporting the CL5K by sponsoring the main race and age category prizes. The long-established, independent sports store and running specialists, has been serving Bolton from its Blackburn Road base since 1923, and now offers The Good Health Centre physiotherapy above the store. Further thanks go to Steve Bateson of Runningpix. Steve will be present, as ever, snapping away at various points on the course, catching ALL participants in full stride with his professional eye. These will be available to purchase from his RunningPix website within a few days.